Today in Masonic History David Rice Atchison passes away in 1886. David Rice Atchison was an American politician. Atchison was born on August 11th, 1807 in Frogtown which is now part of Lexington, Kentucky. He was educated at Transylvania	University. In 1829 he was admitted to the Kentucky Bar. In 1830, Atchison moved to Liberty, Clay County, Missouri and set up a legal practice. His biggest client was Joseph Smith, Jr., founder of the Church of Latter Day Saints. He represented Smith in land disputes with non-Mormon settlers. The disputes would later develop into what is known as the Mormon War of 1838 when the land disputes turned violent. In 1834, Atchison was elected to the Missouri House of Representatives. He worked on the Platte Purchase which, in 1837, increased the size of Missouri by expanding the territory to the Missouri river. When the Mormon War broke out, Atchison was made a major general in the state militia and was sent to put down the violence that was occurring on both sides. That same year, in 1838, he was reelected to his seat in the House of Representatives. In 1843, Atchison was appointed to fill a seat that was vacated by the death of the sitting United States Senator. At the time Atchison would be the youngest Senator from Missouri. In 1949 he was elected to the Senate seat and would be the first person from western Missouri to be elected to the position. Atchison was very popular with his fellow Democratic Senators with the exception of the other Senator from Missouri, Thomas Hart Benton. The two Senators disagreed primarily on the issue of slavery. Atchison was pro-slavery and worked with Senator Stephen Douglas on the Kansas-Nebraska act. Douglas and Atchison felt that Nebraska was going to come into the Union as a free state and Kansas by the pro-slavery settlers. As it turned out, Kansas was largely settled by the free-soliers from the North. Kansas would have come into the Union immediately as an anti-slavery state, tipping the balance in Congress. Atchison rallied troops, called the Border Ruffians, and headed to Kansas, there they took over all the polling places by gun point and then cast 10 of thousands of ballots for pro-slavery candidates. Despite the outrageous nature of this clear overthrow of democracy and the complaints of the Governor of Kansas to the Federal government, the election results stood. Despite these actions, in 1861, Kansas became a free state. During Atchison 1949 term in the United States Senate he was elected President pro temore of the Senate. This put him third in line for the Presidency. 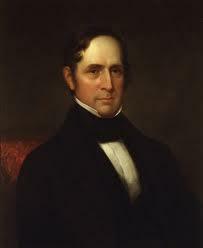 By a bizarre fluke of dates, some claim that Atchison was President for one day between James Polk and Zachary Taylor. As the theory goes, Polk's term ended on March 4th, which was Sunday and Taylor refused to be sworn in on a Sunday and waited until Monday to be sworn in. Despite the gap in sworn in Presidents, most scholars and historians find this assertion completely false. Despite not being sworn in Taylor as the elected President became President when Polk's term ended. Later in life Atchison would make fun of the theory, and although he always maintained that his alleged one day presidency never happened, he quipped that not one woman or child shed a tear on account of him removing anyone from office during his presidency. Atchison served as a General in the Missouri Militia for about year at the beginning of the Civil War and did see some combat. After the Civil War, Atchison walked back much of what he had previously said in favor of slavery. Unfortunately his home in Missouri burned to the ground shortly before his passing and all of his personal records about the Mormon War, the Civil War and other events in his life were lost in the fire. Atchison passed away on January 26th, 1886. Atchison was a member of Platte Lodge No. 56 in Platte City, Missouri.